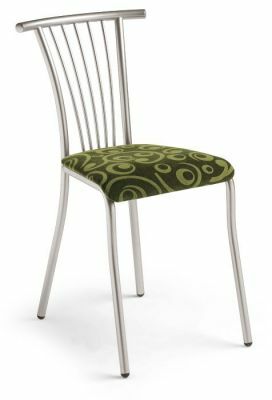 Bistro or Cafe chair with a robust steel frame in Chrome or Aluminium Silver and soft upholstered seat pad in a choice of fabric or vinyl options. Includes a free United Kingdom delivery. Stylish contract grade manufactured chair with a wire metal back, frame in stylish chrome or silver.